Monitor meetings, analyze trends, informs trainers and partners & prepare GHR’s brainstorming sessions and Expert Seminars. 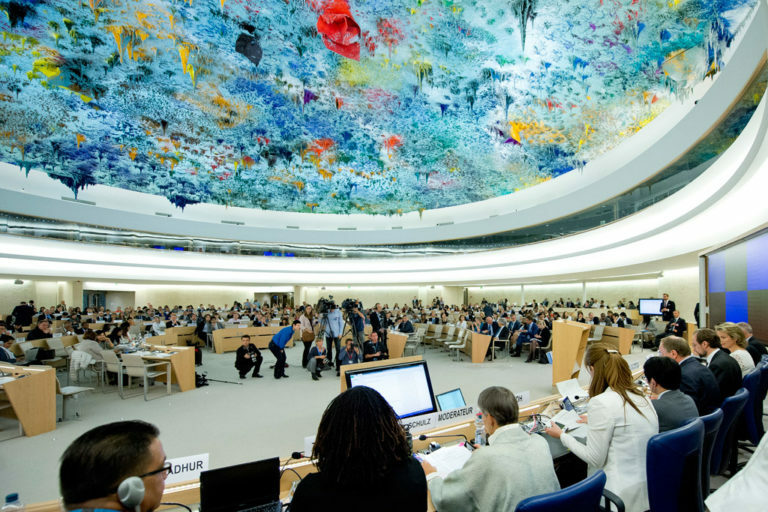 Geneva Courses during HRC sessions, In-Country Courses in-between the Council’s sessions, Courses & Briefings during the Universal Periodic Review. ‘Implementation Now’, develop national capacities, facilitate implementation, contribute to the processes in particular countries, teach strategies. 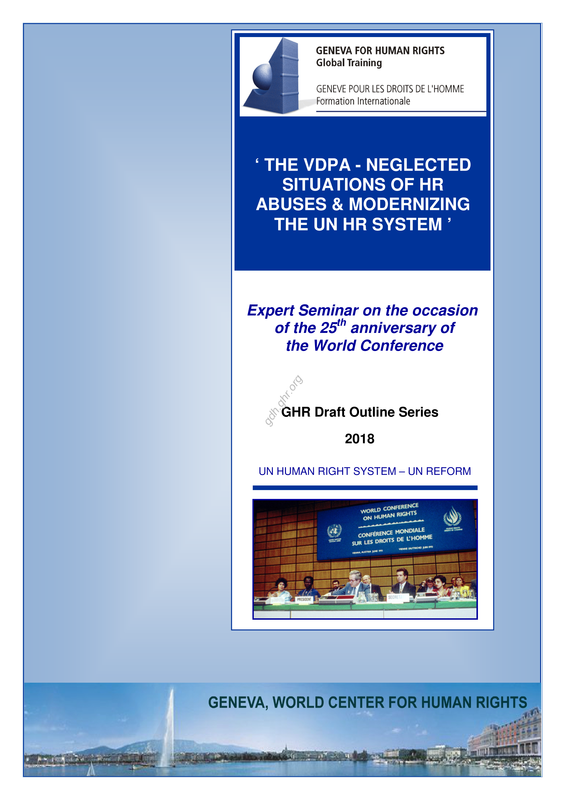 On 6 June 2013, GHR realized its first Expert Seminar of on the implementation of the outcome of the World Conference. This second Expert Seminar is convened on the occasion of the 25th Anniversary of the ‘World Conference on Human Rights‘ (which took place in Vienna from 14 to 25 June 1993). exchanging on proposals to modernize the UN human rights system, in order to seriously improve the UN human rights system and to ensure a better implementation of universally adopted human rights standards. and to discuss the gaps in the UN mechanisms and procedures. Dorian Oldemar Flores Andy (Kichwa, Ecuador). 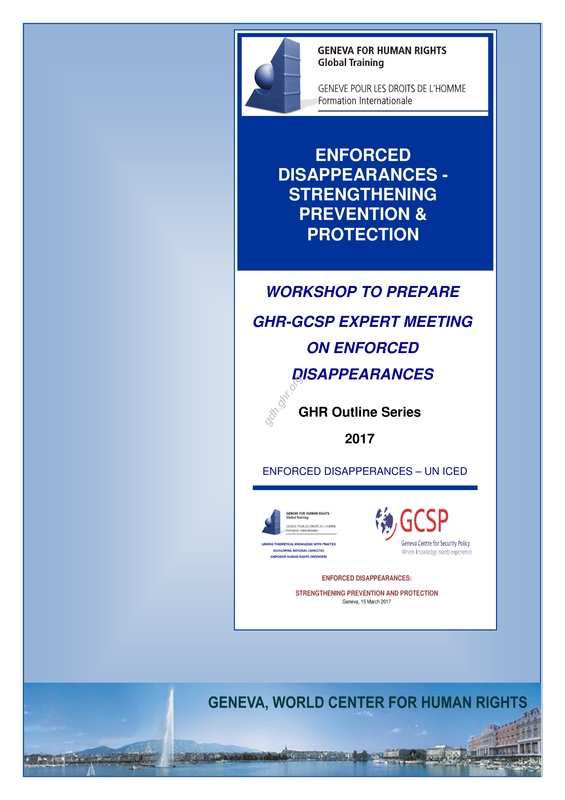 With the confirmation of the mandate of the CED and the goals adopted at the UN Assembly High-Level Meeting, GHR and GCSP offer a platform for reflection on ways to strengthen the prevention of and protection from the crime of enforced disappearance. strategies to obtain a substantial increase in the financial and human resources for both the CED and the WGEID. 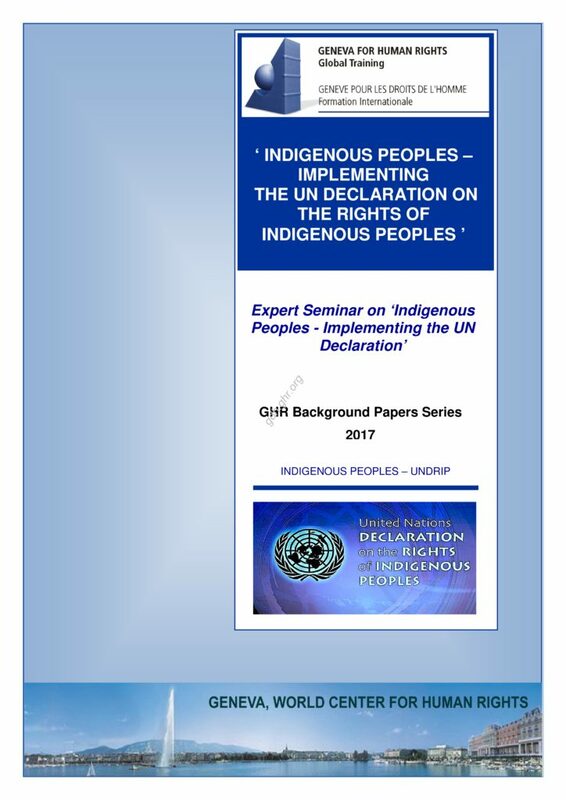 GHR has a specific ‘West Papua Human Rights Project’. This training project is part of GHR implementation programme and aims at supporting strategies for implementation. The Huan Rights Policies Studies (HPS) Department supports all GHR training activities. It monitors international negotiations, covers all meetings of United Nations Human Rights bodies, analyzes the main trends, and informs our trainers and partners in the field. Logically, HPS is entrusted with the preparation of GHR brainstorming sessions and Expert Seminars. GHR Global Training Department has set up training programmes. The Geneva Courses and Seminars during the WG on UPR and the HRC are part of the Programme on the participation of Human Rights Defenders to the HR-Council. The Specific Experts Seminars are prepared by our HPS Department, which is composed of fellows and students from several universities. As a training centre, Geneva for Human Rights – Global Training has to promote monitoring, analysis and reflection. Thus, it regularly convenes in Geneva lectures venues and brainstorming sessions on the main issues dealt with by the Human Rights Council and its satellite organs. Groups of diplomats, scholars, civil servants and defenders are invited to attend GHR brainstorming sessions.